We offer different types of braces including conventional metal brackets, self ligating brackets, clear brackets, invisalign & Invisalign teen, and lingual braces (braces from the tongue side). Each system has its own advantages and disadvantages. Please talk to your orthodontist to see what system is the best for your treatment. 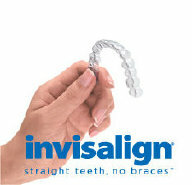 If you want braces but don't want a mouth full of metal, we are offering clear braces with esthetic wires !!! A great option for our adult ortho patients!! Shown above is one of our patients who has clear braces and esthetic wires.